What does Barack Obama really think about Israel? The evidence makes it obvious; he has contempt for the Jewish State in every way, and his nurturing of Islamist takeovers around the Middle East only adds to the perception that the safety of Israel is not of concern to him. Obama backed an extraordinary session at the UN Security Council where the United Nation’s High Commissioner for Human Rights, the notoriously anti-Israel Navi Pillay, briefed the Council on the subject of Israel–and Israel alone, as if Israel were the worst offender of human rights in the world. How about the repeated efforts by Obama to publicly humiliate Israeli Prime Minister Benjamin Netanyahu? And the time Obama stated that Israel should return to the suicidal pre-1967 borders? Or the elision from the 2012 Democratic platform of some key elements from the 2008 platform, namely that Israel was the strongest US ally in the Middle East, that Hamas should be isolated from being a partner in the peace process, that the bogus Palestinian right to return should be opposed. Or the refusal to name Jerusalem the capital of Israel, and the absolute unwillingness to condemn Arab terrorism. The Palestinian people must support leaders who reject terror, embrace the institutions and ethos of democracy, and respect the rule of law… Israel should not be expected to negotiate with entities pledged to her destruction ……radical elements like Hamas and Hezbollah must be isolated because they do not meet the standards of peace and diplomacy of the international community. Hillary Clinton’s 43-minute telephone pillorying of Netanyahu for announcing construction in a Jewish neighborhood of Jerusalem. Joe Biden ripping Israel for endangering American troops in Iraq and Afghanistan. Clinton’s demand that Israel unilaterally concede negotiating positions and release hundreds of Palestinian terrorists even before “indirect” peace talks could begin. Defense Secretary Leon Panetta’s chastising Israel to “get back to the damn [negotiating] table. 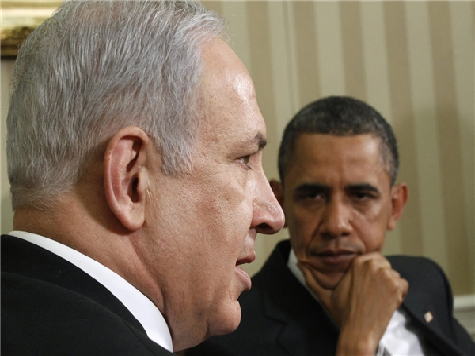 Obama shoving PM Netanyahu out the White House back door, no dinner, no joint statement. Obama’s speech, sandbagging Netanyahu just before he arrived in Washington, calling on Israel to retreat to the 1949 Armistice line as a starting point for negotiations? No condemnation whatsoever for the anti-Israel incitement by the Palestinian leadership, including celebrating the grisly murder of the Fogel family and their sleeping little boys and baby girl? No condemnation of the Grand Mufti of Jerusalem — whose salary comes from American taxpayers — urging Arabs to “fight and kill the Jews”? The thought of Jews in America voting for this man, (Jews who are largely secular and have long ago eschewed their tradition), this man who has an animus toward Israel greater than any other president, is enough to make you wonder if those same Jews value Israel at all. They certainly don’t have the allegiance to Israel that a Jewish identity demands. If they see themselves as part of Jewish history at all (and many don’t) they should know that their reelection of Barack Obama will have terrible and final consequences for the Jewish people.